Bella Notte has introduced two new colors to its dye collection. Midnight is an exceptionally rich shade of Indigo; it is sensual, serious, and sophisticated. Meanwhile Rosegold, a ‘glowing’ copper/blush, intentionally defies genre to stick out from its surroundings. Textural and velvety, Vienna is Bella Notte’s new and rich chenille. Vienna’s tonal composition reveals a Renaissance pattern up close and a very natural, Earthy texture from afar. 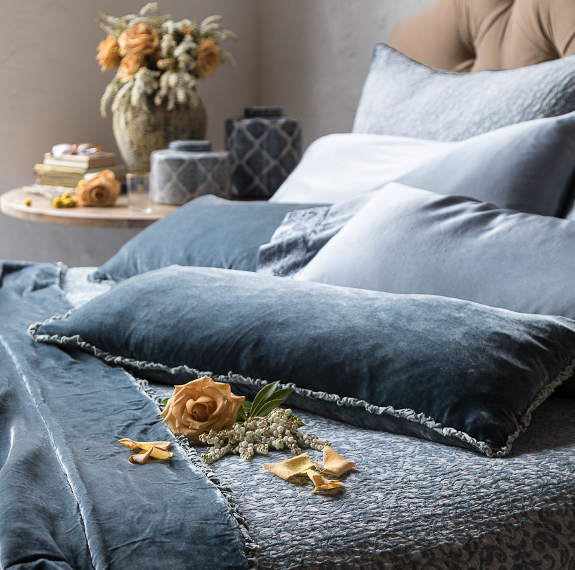 An elegant canvas for layering, duvet covers, pillow shams, lumbar pillows, blankets and coverlets are trimmed in Silk Velvet and available in each current color. 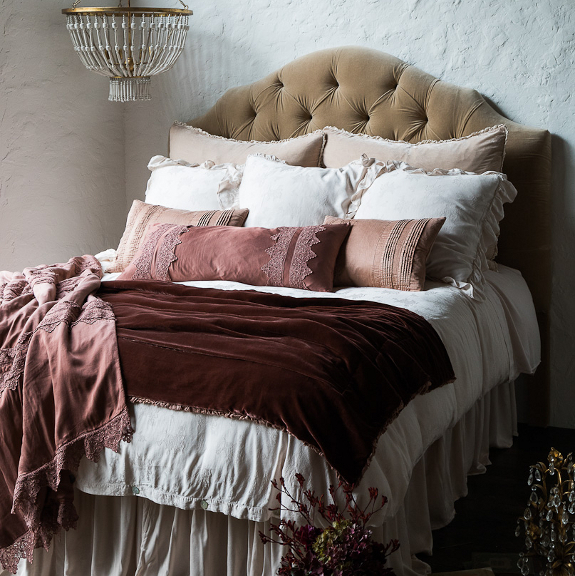 Persephone simply compliments Bella Notte’s popular Madera Luxe lyocell sheeting by framing it in an embroidered Silk Organza flange. A duvet cover and accent pillow are available in addition to pillow shams. Small addition, big improvement; Carmen is Bella Notte’s classic Silk Velvet framed in shimmering charmeuse. 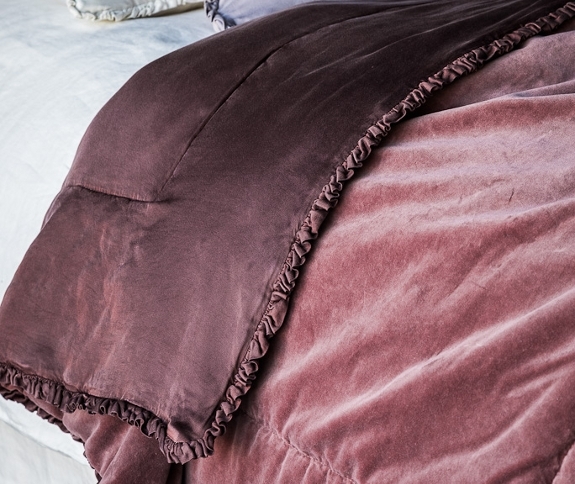 Her petite ruffle, with raw edge, adds a hint of color-play to your bed. She is offered in shams, pillows, and a luxurious Personal Comforter, backed in Silk Velvet. The Helane collection – featuring classic cotton velvet framed in a petite satin ruffle – now includes a lightly padded Personal Comforter which is instantly the star of the collection. 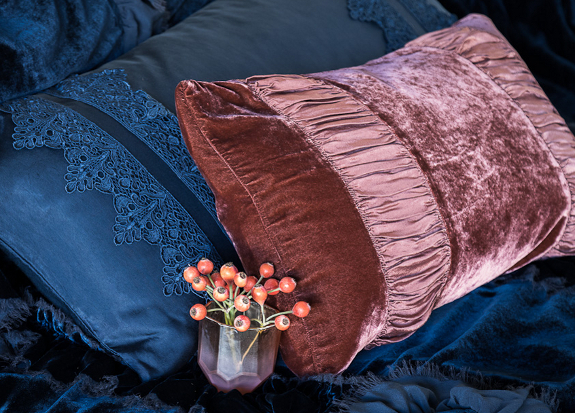 Bella Notte’s perfectly proportioned Lumbar Pillow (16×36) is now available within the following collections: Arielle, Carmen, Marseille, Satin with Venise Lace, Silk Velvet Quilted & Vienna. Unfortunately, with the new must go the old. Colors Thyme and French Grey, collections Penelope, Chesapeke, and Emma, and the Silk Velvet Quilted 18×18 Throw Pillow have fallen to the wayside. The Penelope, Chesapeke, and Emma collections, however, remain available for sale while supplies last – or until August 31st, whichever comes sooner. This entry was posted on Tuesday, May 30th, 2017 at 5:10 pm	and is filed under Official Updates. You can follow any responses to this entry through the RSS 2.0 feed. You can leave a response, or trackback from your own site.